If you're a fan of grilling outdoors but not the mess of charcoal grilling or the embarrassment that comes from running out of propane when the steaks are still mooing, you should consider switching to an outdoor electric grill. Today's models are efficient and safe and some are large enough to cook the food for a small picnic. Best of all, electric grill maintenance is much easier than for gas or charcoal grills. With regular cleaning both before and after usage, an electric grill will provide great barbecued foods for years. Once you've purchased your electric grill, place it in the space or on the tabletop where you'll be doing most of your grilling. It's best to locate the grill where it can be plugged directly into an outlet instead of using an extension cord. While most outdoor outlets are grounded, it's a good idea to use a surge protector for added protection in the event of electrical storms or power outages. It's also recommended to unplug electric grills when not in use. If the grill will be stored outdoors, invest in a quality cover made to fit it to keep the finish in good shape and keep unwanted critters from invading it. As with all grills, it's important to prepare an electric grill for its first use. This means seasoning or curing the cooking surfaces with oil. 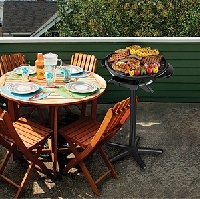 Remember to do all maintenance and cleaning of electric grills with the grill unplugged and the grill completely cooled. For added protection, consider wearing heat gloves. To season your grill, pour cooking oil into a bowl, then dip crumpled paper towels in the oil and rub it liberally all over the grates and the top side of the searing plate. Then, plug in the grill and run it on the 'sear' setting for fifteen minutes, followed by another fifteen minutes on the highest setting. Turn the grill off, unplug it and let it cool off. The most important task in electric grill maintenance is cleaning. This is best done as soon as you�re finished grilling and the unit has cooled down, but not completely, for ten to fifteen minutes. Leave the drip pans in place until you�re finished to catch debris and dirty water. Many electric grills come with a plastic scraper for removing charred food off of the grates. Use these scrapers carefully to avoid damaging the grill�s nonstick finish, then wipe the grates off with dry paper towels. Next, dampen the grates with a sponge loaded with hot soapy water and let the suds soften the cooked-on food for fifteen to thirty minutes. Wipe off the soap and grease with more dry paper towels. If there is still residue, try a baking soda paste or a commercial grill cleaner. Once the grill cleaning is done, remove the drip pan and discard it if it�s disposable or wash and dry it completely before putting it back in the grill. Wipe off the outside of your grill with a damp sponge or wipe, dry it and cover it up and your electric grill is ready for the next backyard barbecue. With their ease of use and even easier electric grill maintenance and cleaning, these plug-in grills are fast becoming the choice for healthy outdoor grilling.